Test your knowledge of Corvette trivia with historical information about each model year. Links include photos, factory options, prices, color choices, and build quantities. In 1951 a group of Harley Earl's "Special Projects" crew began work on a GM sports car. Bob McLean designed a general layout for the car which was originally code named, "Opel." Myron Scott, at the time Chevrolet's Chief photographer, is credited with coming up with the Corvette name, drawing from the small, fast warships of the "Corvette" class. The Jaguar XK120 is believed to have been the inspiration for the first Corvette. The Corvette was the first and last car with a true "wrap-around" windshield. Corvette was not the first to be made with a fiberglass body, but it was the first to be built by a company the size of Chevrolet. Corvettes have been assembled in three different cities. Flint, Michigan, St. Louis, Missouri, and Bowling Green, Kentucky. While many were involved in its design and production, Belgium-born Zora Arkus-Duntov is generally considered to be the "Father" of the Corvette. The original front emblem and horn button on the "Autorama" show circuit Corvette featured crossed American and checkered flags. It was later discovered that using an American flag on a product trade mark was against the law and the emblem was changed shortly before the New York Motorama. On Tuesday, June 30, 1953 Corvette #1 Serial Number E53F001001 rolled of the assembly line, and Corvette production began. Want the rarest Corvette? In 1953 the first two Corvettes, VINs 0001 and 0002, were said to have been destroyed, but no records prove that fact and there are no witnesses to the destruction. Who knows? They still might be out there somewhere. Of the 300 (some sources argue 314) Corvettes hand built in 1953 only 183 were sold because of "average" performance at a relatively high price, $3513. The popular Jaguar XK120 sold for $3345; $168 less than the Corvette. 1953 Corvettes were offered in any color you wanted... as long as it was Polo White with Red interior. A heater and an AM radio were the only Regular Production Options (RPO) offered with 1953 Corvettes. Production moved to the St. Louis facility for the 1954 model year. The 1955 Corvette finally achieved "true" sports car status with the introduction of 265 cubic inch, 195 hp V-8 engine and 3-speed manual transmission. There are 13 vertical bars or "teeth" are in the grill of 1956 Corvettes. For the first time since its introduction, the '58 Corvette came with factory-installed seat belts. Optional engines in 1956 had 9 fin alloy valve covers, 1957 had 7 or 9 fin alloy valve covers, and the 1958 had 7 fin alloy covers on optional engines. 1959 was the only year that turquoise soft tops were available. Nylon belted tires first became available on the 1960 Corvette, prior to 1960 only cotton ply tires were offered. The 1961 Corvette was the last year to feature "wide whitewall" tires. The 1961 Corvette dropped the "round" nose emblem of previous years in favor of the word "CORVETTE" spelled out as individual letters. Luxury amenities such as power steering, air conditioning, and leather seats were first available in the 1963 Corvette. The earliest serial number air conditioned Sting Ray has a production build date in October, about 6 months before the rest of the A/C cars. It seems the owner was a GM executive who had the car returned to Chevrolet for refitting with A/C. The 1963 roof panel molds were built using wrong dimensions, such that all roof panels were too small. This left a gap seen in the door pillar above the door latch in all but a few cars. The ones where it is not found were cosmetically covered up with body filler. The famous "split" rear window for the new Corvette almost never came to be. It seems that Bill Mitchell and Zora Arkus-Duntov argued over the design. Bill Mitchell won out for the 1963 Model, but it was removed for 1964 never to be seen again. The 1963 Grand Sports, while originally looking much like the production coupes, had no body parts in common. The fiberglass body panels were roughly half the thickness of production panels to save weight. The 1963 Grand Sports originally were released without fender flares, using the stock look. However, they were wider to allow a wider tire 8.25x15 rather than the stock 6.70x15 tire. Aluminum knock off wheels only cost $322 for a set of 5 in 1964. Only the driver's side vent on the 1964 Corvette is functional. Side mounted exhaust systems first appeared in 1965. While the 427 was developed first, the 396 went into the Corvette, Chevrolet, and Chevelle in 1965 due to a GM policy restricting them to less than 400 cubic inches. The 1965 396ci 425hp engine option lasted only one year. 1966 marked the last year for knock off wheels but the first for shoulder harnesses and headrests. The 1966 Corvette was not eligible for the SCCA Trans Am, due to the upper limit of 5.0 liter on engine displacement. Chevy's only eligible car was the Corvair. Only 20 RPO L88 427 engines were opted for in 1967. To discourage street use, GM rated these engines at a conservative 430 hp (5 HP less than the L71 engine option) although they actually pumped out well in excess of 500 ponies. 1967 was the first year to have three hood styles: the small block hood, the big block hood, and the L-88 hood, even though externally the L-88 looked like the regular big block hood. In late February/early March, 1967, some small blocks received the big block hood due to an manufacturing problem with the small block hood mold. These were not given the hood stripe. The "GM Mark of Excellence" sticker appeared, placed on the inside driver's door jamb, appeared in 1967 only. Federal law mandated the removal of spinners from wheels in 1967, so the knock off wheel of 1963-66 was replaced with a bolt on wheel. The '67 model was the first to have the "tank sticker", or the build sheet, attached to the gas tank. A 36 gallon fuel tank, the largest ever offered, was available as an option in the Corvette from 1963 to 1967. The speed warning indicator option lasted for only three production years... 1967, 1968 and 1969. The '67 LeMans Racer was "DRIVEN" to the track from the airport (in place of being trailered) because the trailer was chuck full of parts! For 1968, a factory installed anti-theft alarm system was available as an option, but less than 400 cars were so equipped. Pontiac almost beat Chevrolet to the Coke bottle design body, with their 1965 Banshee, a two seater convertible sports car that would have been hefty competition for the Corvette. GM stopped it, and then Pontiac president John DeLorean later became president of Chevrolet. Due to policy changes at Chevrolet, Corvette was treated like all other car lines for the first time, and quality dropped drastically. With bad publicity in most magazines, policy was re-thought and Chevrolet quickly restored independence and higher quality to Corvette production within a few months. Many believe that all 1968 models still carry the stigma of having "the worst quality" of all Corvettes. In 1968, all big block manifolds were redesigned to actually sink into the lifter valley as the hood clearance was less than in '67 and earlier models. As such, a 1965 to 1967 big block intake manifold won't fit in a 1968 or newer Corvette with a stock hood and air cleaner. The exception to the above was the L-88. It retained the high rise manifold and also received a special hood, which was externally different to the regular big block hood. Emission control equipment was installed on the first 1968 models in the fall of 1967 even though the federal law required it only as of January 1, 1968. Corvette had its first all aluminum engine in 1969 as the ZL-1. It was not the first GM automobile to do so, however, being beaten by the Corvair in 1960 and the Buick 215 V8. In 1970, big block engines increased from 427 to 454 cubic inches and the powerful 370 HP LT1 small block engine made its debut. 1970 sales were their lowest since 1962 (only 17,316 units) due to a late start in the production year. 1971 was the last year for fiber optic warning lights, first introduced in 1968. The only external difference between the 1971 and 1972 Corvettes is the amber front turn signals and chrome plating on the egg-crate grills on the 1972. Although 1973 VINs run to 34464, only 30,464 units were built; the 4,000 serial numbers between 24001 and 28000 were never used. In 1973, aluminum wheels were again listed as an option. However, their inability to maintain air pressure (much like the problems which plagued the early 1963 aluminum knock off wheels), kept them out of the hands of customers until 1976. The rear view mirror in the 1974 Corvette was increased to a width of 10 inches. The last true dual exhaust was installed in 1974. After that, all exhaust gases were channeld through a single catalytic converter. The big block engine made it's final curtain call in the 1974 Corvette. 1974 was the last year the Corvette would be produced to run on "leaded" gasoline. 1975 was the first year for a HEI distributor. The convertible was discontinued after the 1975 model year and would not reappear again until 1986. GM cited declining sales for convertibles (only 4,629 units in '75) and safety concerns as reasons for killing the ragtops. 1976 Corvette used the same steering wheel as a Chevrolet Vega for the "Sport Steering Wheel" Option. Due to stricter emissions standards, California Corvette buyers could not opt for the L82 engine in 1976. The 500,000th Corvette, a white 1977 coupe, rolled off the St. Louis assembly line at 2:01 P.M. on March 15th, 1977. 1977 was the last year for the notch back roof line. The 1978 model saw the first fastback rear window since 1967. The '78 Pace Car's distinguishing "Black and Silver" paint was chosen over other alternative color schemes primarily because it photographed well. Back then, most magazine articles and ads were still done in Black & White! Crossed flag emblems returned to the nose and sides of the Corvette in 1979. More Corvettes were built in 1979 than in any other year, before or since... a total of 53,807 units were produced. Due to tougher emission standards, Corvettes bound for California were fitted with 305 cubic inch engines. The 305 cubic inch V-8 installed in 1980 California-bound Corvettes was the first Corvette engine to be monitored by a computer. Since 1981, all Corvettes have been computer equipped. By Federal mandate, the 1980 Corvette was the first Corvette to have a speedometer with an upper limit of only 85 MPH. In 1982, console mounted clocks were quartz units and had the word "QUARTZ" printed on the face, while the 80-81 years did not. While never offered to the public, a total of 43 - 1983 model Corvettes were built. There were so many quality problems with them it was decided to halt production until they could be corrected. By the time the problems were corrected, it was so late into the model year that the car was brought out as a 1984 model and was run for a year and a half. The only verifiable 1983 Corvette still known to exist is on display in the National Corvette Museum in Bowling Green, Kentucky. The L98 engine made its debut in 1985 offering a horsepower increase from 205 to 230 plus a gain in fuel enconomy due in part to new Bosch fuel injection with tuned runners. All 1986 convertibles were Indianapolis Pace Car replicas and came with a pace car decal package (to be installed at the buyer's option), but none had special paint or options. The actual Indy Pace Car used at the 1986 race was yellow in color. Twenty 1986 Corvettes were sent to Lotus in England to be converted into LT5 powered prototypes for the ZR1 project. In 1986, Corvette offered the "Malcolm Konner Commemorative Edition" with two transmissions. A manual 4-speed and an automatic. Only 20 4-speed manual transmissions were installed at the factory. A total of 16 exterior colors were available for both 1982 and 1987 Corvettes, the highest number of exterior color choices offered in Corvette history. To mark its 35th anniversary, a 1988 special anniversary edition was available with white paint, wheels, leather interior and special emblems. All 2,050 35th Anniversary Editions were built as coupes. A total of 56 street-legal but race prepared 1988 Corvettes were built for the SCCA Corvette Challenge Series. In 1988, Corvette started using a unidirectional 17" wheel. The FX3 adjustable suspension option, permitting shock valving changes via a rotary dial mounted on the interior console between the seats, was first introduced in 1989. The long awaited, high performance ZR-1 option package was finally publicly available in 1990. It included special rear body panels and an all aluminum small block designated the LT5, producing 375 hp. All LT-5 engines for the production ZR-1 option were built by Mercury Marine in Stillwater, Oklahoma. The last year for the Callaway twin turbo option was 1991, selling 62 units at $33,000 each. In comparison, the ZR-1 option was a bargain at "only" $31,683. 1991 was the 10th anniversary of Corvette production at the Bowling Green, KY plant. 1992 saw the rebirth of the legendary LT1 small block engine as a 300 hp motor with reverse flow cooling and two valves per cylinder. A special 40th anniversary model was released for 1993 with one year only Ruby Red exterior and interior colors. The end of the 4th generation Corvette was marked with two special editions... a "Collector Edition" in Sebring Silver trim and a "Grand Sport" in Admiral Blue with Actic White racing stripe. A total of 1,000 Grand Sports were built and of these, only 190 were convertibles. Collector Editions comprised 25% of total production with 5,412 units built. For 1996, LT1 engines required automatic transmissions. The ZF 6-speed was mandatory with the 330 HP LT4 engine option. The 1996 Grand Sport is readily identified by it's striking Admiral Blue and Arctic White stripe paint scheme. What many do not know, however, is that the pinstriping on either side of the large white center stripe, is actually a two-color decal, both blue and white. This was done to ensure a perfectly straight line. Only 53 1996 Grand Sport Convertibles were built with the Red/Black interior option. The 1997 Corvette features several first-time high tech innovations, such as black lights for the instrument panel and a "plastic" (composite) intake manifold. The 1998 Corvette convertible is the first to offer the same sport suspension package as the coupe. Since the C5 was designed from the start as a convertible model, the ragtop is nearly identical in structural rigidity to the coupe. The first Corvette to sport a real trunk since 1962 again appeared with the 1998 Corvette convertible. November 4, 1997 - The 9752nd 1998 Corvette rolled down the assembly matching the total 1997 Model production run. The last "Fairway Green" C5 came down the assembly line as a '98 model on November 10, 1997. The color was discontinued due to poor sales. It takes 55 hours to build the new C5 Corvette, down from 70 hours for the previous C4 model. For the first time in history, the 1999 Corvette is available in three disctinct body styles... Coupe, Convertible, and Hardtop (aka, "Fixed Roof Coupe"). The 2000 Corvette featured new color choices to celebrate Y2K... Millenium Yellow and Dark Bowling Green Metallic... plus a new Torch Red interior option. 2001 will forever be remembered as the year the Z06 performance hardtop was introduced with its 385HP LS6 engine and 6 speed manual transmission. The 2002 Corvette featured a new color, Electron Blue Metallic, and an upgraded 405HP LS6 engine for the Z06. The 2003 Corvette heralds the 50th anniversary with a special edition in Anniversary Red with Shale interior and a new, high-tech magnetic suspension option for all models but the Z06, which continues essentially unchanged from the 2002 model year. In addition to Anniversary Red, Medium Spiral Gray Metallic was a new color in 2003. The Magnetic Ride Option offered in 2003 uses a magnetic fluid which adjusts shock damping 1,000 times per second, roughly equivalent to reacting to each inch of road surface at 60 mph. 2004 marks the last of the extremely successful fifth generation Corvette and was celebrated with the special Commemorative Edition Corvettes in Lemans Blue with special badging, graphics and interior appointments. 2005 marks the introduction of the sixth generation Corvette... the C6. One factory-painted Torch Red 2005 Corvette actually carried the Precision Red paint code (27). 2006 saw the re-introduction of high performance Z06 model, weighing only 3132 pounds with a 427 cubic inch dry sump engine producing 505 HP. Daytona Sunset Orange Metallic, a popular color choice in 2005 & 2006, was replaced by Atomic Orange in 2007, an extra cost color choice. The total 2009 Corvette production run of only 16,956 cars was the lowest since 1962's production run of 14,531 units (not counting 1997's run of 9,752 cars due late introduction of the new C5). 2010 saw the return of the legendary Grand Sport model nomenclature but with less exclusivity than the 1996 limited edition of only 1,000 special VIN-sequenced, uniquely painted blue & white cars. The 2010 Grand Sport model replaced the Z51 performance handling option and features the base LS3 engine but is equipped with the wide body panels, larger wheels/tires, and other parts derived from the Z06. Atomic Orange was replaced by Inferno Orange in 2011. Two Z06 exclusive options debuted in 2011. The CFZ Carbon Fiber package featured black carbon fiber splitter, rockers, roof panel and body-color ZR1 style full-width rear spoiler while the Z07 Performance Package had Brembo ceramic brakes, Magnetic Ride Control, larger Michelin Pilot Sport 2 tires and competition gray 20-spoke wheels. The ULZ Carbon Limited Edition package for the 2011 Z06 was created to celebrate Corvette's 50th anniversary at LeMans. Carlisle Blue was a new color added to the lineup in 2012, retiring the popular Jetstream Blue Metallic color. To celebrate its 100th birthday, Chevrolet created a racing inspired Centennial Edition appearance and suspension package for the entire line of 2012 Corvettes. Available on all models, it features Carbon Flash Metallic paint with Centennial Satin Black wheels and red brake calipers. Black was not available as an exterior color in 2012 in favor of the special Carbon Flash Metallic paint featured on the Centennial Edition. The 2013 model year marked Corvette's 60th Anniversary and the final year for the C6 generation. To celebrate Corvette's 60th Anniversary, GM offered a special 60th Annivesary package available on all 2013 Corvette models plus a 427 Convertible Collector Edition. The 2013 60th Anniversary Package featured an Arctic White exterior with Blue Diamond leather-wrapped interior with suede accents. An optional graphics package added full-length racing stripes in Pearl Silver Blue and a tonal stripe stitched into the convertible top. The 2013 Corvette 427 Convertible Collector Edition was the fastest, most capable convertible in Corvette’s history, blending elements from both the Z06 and ZR1 models. 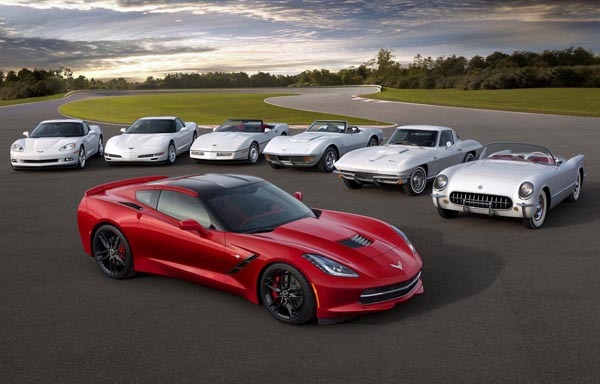 2014 marks the introduction of the seventh generation Corvette... the C7. The new LT1 6.2L V-8 base Corvette engine delivers 455 HP, 460 lb-ft torque (+5 in each with the addition of the optional Performance Exhaust System). The 2014 Corvette is the first to be equipped with Direct Injection technology with ensures a more complete burn of the fuel in the air-fuel mixture, improving combustion efficiency and thus contributing to increased power and fuel economy. Active Fuel Management, or cylinder deactivation, is a first-ever application on Corvette and helps save fuel by imperceptibly shutting down half of the engine's cylinders in light-load driving. The 2014 Corvette convertible features a standard power top which can be lowered at speeds up to 30 mph, or from outside the car using the key fob remote. The big news for 2015 was the introduction of the C7 Z06 featuring a brand new 650 HP supercharged LT4 engine. For the first time, the Z06 could now be ordered as a coupe with removable roof panel or a convertible with choice of a 7-speed manual transmission or new 8-speed automatic. For 2015, the previously optional Performance Data Recorder (PDR) was included at no extra charge with the Navigation system. Every 2016 Corvette Stingray comes with a flat-bottom steering wheel and Magnetic Ride Control is available as a free-flow option on any 2016 Corvette. Corvette Racing Yellow and Long Island Red are new colors for 2016, replacing Velocity Yellow and Crystal Red. Three new design packages were offered 2016 Stingray customers: Twilight Blue, Spice Red, and Jet Black Suede with special accents. The big news for the 2017 model year is the return of the Corvette Grand Sport, combining the styling and handling of the Z06 with the base 460 HP LT1 engine. 2017 offered a Grand Sport Collector Edition featuring an exclusive Watkins Glen Gray Metallic exterior with Tension Blue hashmark graphics, satin black full-length stripes, black wheels and a unique Tension Blue full leather and suede-wrapped interior. The big news for the 2018 model year is the return of the Corvette ZR1 complete with some serious aero options and a 750HP LT5 engine. consideration for this page, please let us know. Verifiable facts only, please. Rumors and myths need not apply. Published by Michael Bruce Associates, Inc.